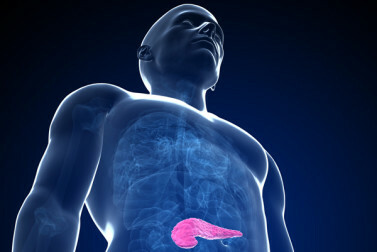 The gallbladder is a pear-shaped, pouch-like organ that sits just under the liver. Its job is to produce and store bile, a substance that aids in digestion. Bile is made up of water, acid, cholesterol, bilirubin, and lecithin. The gallbladder sends bile through a series of ducts to the intestines, where it helps break up fat. When bile contains too much cholesterol or bilirubin, these substances can form clumps, called gallstones. 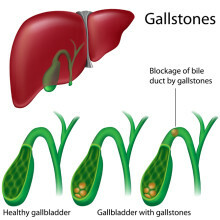 If gallstones get caught inside a duct and block the flow of bile, you can develop a condition called cholecystitis. You?re more likely to get gallstones if you?re overweight, you?ve gained or lost weight rapidly, you have diabetes, or you have a family history of gallstones. Gallstones can produce symptoms such as abdominal pain, nausea, vomiting, gas belching, or feeling unusually full after a meal. If a gallstone is blocking a bile duct, bile can back up and cause yellowing of the skin and whites of the eyes, which is called jaundice. To determine whether you have gallstones, the doctor may do blood tests to detect high levels of bilirubin or other substances that are elevated in this condition. You may have an ultrasound of the gallbladder to look for gallstones, or an endoscopic ultrasound, in which a thin scope is threaded down the esophagus and stomach into the intestine to view the stones. A test called cholescintigraphy traces the flow of an injected radioactive dye into and out of the gallbladder to look for a blockage or infection. Gallstones that don?t cause symptoms are often watched without treatment. 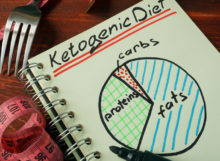 Avoiding fatty foods may be enough to prevent symptoms from occurring. If gallstones do cause symptoms, a technique called lithotripsy can break them up. Or, you may need surgery to remove the gallbladder. Gallbladder surgery is a common procedure, and is often done laparoscopically through small incisions. Many of us want to simplify our lives and do a detox cleanse to ring in the New Year. The simple detox program presented here—consisting of a liver detox tea and the Elimination Diet— is uncomplicated, inexpensive, and effective!